I’ve always loved word games. Let me back up. I’ve always loved the idea of word games. I have fond memories of losing scrabble as a child, so I suppose that’s where this love/hate relationship began. When Words With Friends became the “new big thing” in 2009, I felt, tenfold, the wrath of my ability to suddenly forget every word I’d ever known. I’ll just say it. I’m terrible at word games. Sometimes word games make me feel like Erin Hannon. The Office: Season 7, Episode 12. There are so many other great scrabble moments in that one! Since the Words With Friends phenomenon has died down I’ve kept to longingly gazing at innovative new word games from a distance. With the exception of some extremely stressful rounds of Bananagrams here and there, I’ve mostly kept myself at arms length from this forbidden love. 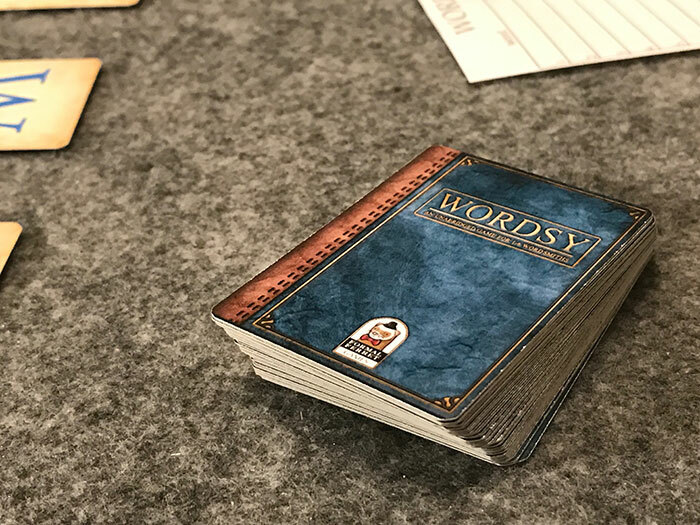 A few weeks ago, Gil Hova, from Formal Ferret Games, was nice enough to send us over a Prototype copy of his newest game, Wordsy. After reviewing The Networks about a month ago, I was extremely excited to see what Gil had up his sleeve this time. To my surprise, he sent us a word game. “Oh man” I thought. “I know i’ll like this, but I’ll also be terrible at it…” Ultimately, I realized that someone can appreciate and understand something even without having a particular skill for it. (I also enjoy soccer, but you don’t want me on your team!) So I got down to business and decided to find out just what Wordsy had to offer. What did I find? Well, this game approaches the idea of what a word game should be in a completely unique and innovative way. It takes a lot of the constraints off of a traditional game of this genre and allows for a more freeform word selection process. This was genuinely refreshing to me as someone who is traditionally bad at word games. All this talk of innovation and freeform word selection probably won’t make sense until you get the gist of the game. Let’s take a quick look at how Wordsy works. 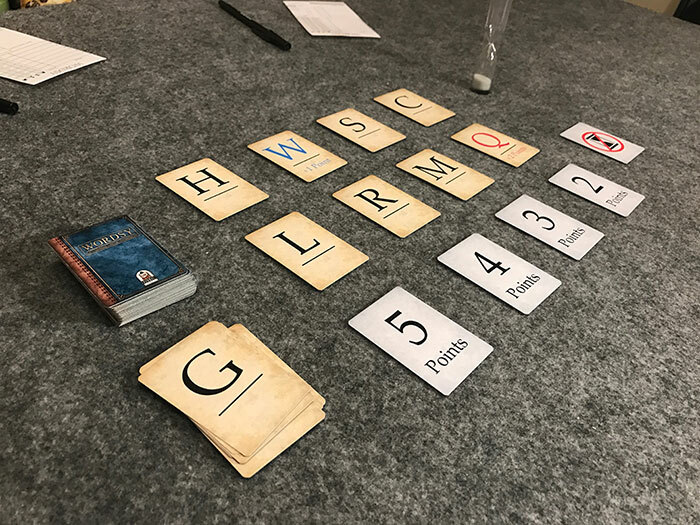 Each round of Wordsy consists of 1-6 players examining two rows of four different cards with various letters in hopes to find the best possible word. Below each row of letters lies a card that denotes the value of the letter in that row ranging from 2-5 points. Some of the more challenging letters (think x, y, z) even have a +1 or +2 bonus on them, depending on how hard they would be to fit into a word. That seems pretty simple, right? Find the most valuable word from eight letters that are each worth different points. Wrong. What makes Wordsy so unique is that it only employs consonants in its pool of letters. I suppose vowels have had their day in the scrabble limelight long enough. Now it’s time for the often ignored consonants to shine! You’d be right, but just sit tight for a second. This is where Wordsy really shines. 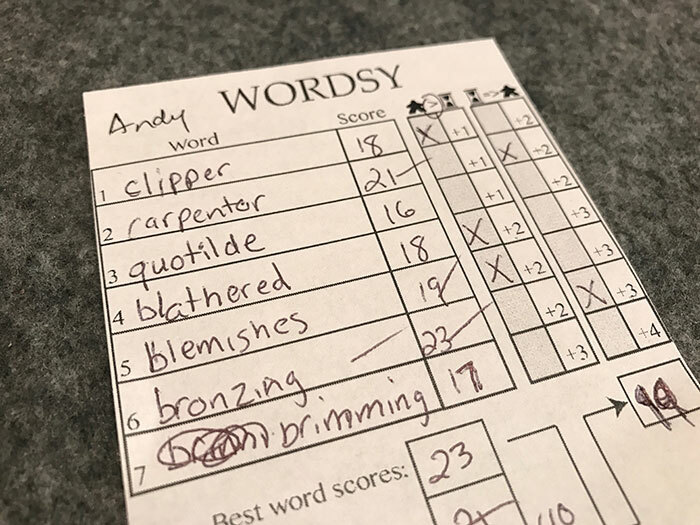 It doesn’t simply ask for you to find the best possible word based off of the given letters…instead Wordsy forces players to look at the available letters and think of any word that contains at least one of them. This means that you aren’t constrained by making words from just eight letters and can instead think outside the box to come up with a word that best utilizes as many letters as possible! This was a really hard concept for me to wrap my head around at first. When I initially heard the concept It didn’t really make any sense to me. “But then you could just use any word you could possibly think of…” I thought. Turns out I was 100% right! It’s hard to grasp why this is such an interesting way to approach it until you play, but when you do, it just clicks. Another interesting part about this game is that it utilizes a timer. 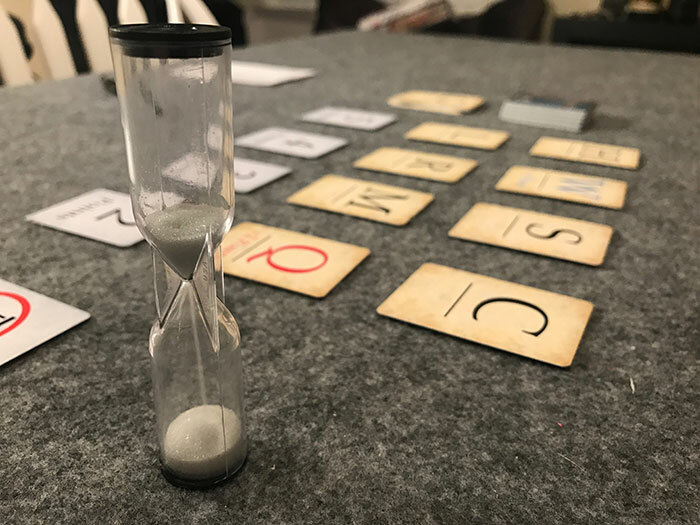 While the timer isn’t active at the beginning of the round, the first player to write down their word can flip it to start the countdown. Once one player springs for the timer, all other players have exactly 30 seconds to get their word to paper. After everyone has tallied up their points, the four lowest value cards (the right half) are discarded, the remaining cards are slid down in their place, and four new cards are dealt out to fill the board. This takes place seven times before the game comes to a close. If the player who grabbed the timer has a word that is worth the same or more points than a certain number of players (based on player count), they will get bonus points. If one of the other players has a word that scores higher than the word from the player who grabbed the timer, they will get bonus points. I’ll admit that this is one of the more confusing parts of the game, but it does add an interesting layer of tension for the player starting the timer. If you’ve come up with a word that seems pretty good, you have to make the call on whether you think it will be at least as good, if not better than the rest of the player’s words. If your word ends up being too small, you’ll give everyone else points. At the same time, if your word is a great word, you may gain some helpful bonus points. Both of these bonus scoring situations will incrementally become more valuable as the game progresses through its seven rounds. During the first round, the first bonus would be worth +2 points and the second +1, but by the end of the game the first will be worth +4 and the second +3. This creates even more incentive for players to want to risk it to grab the timer. 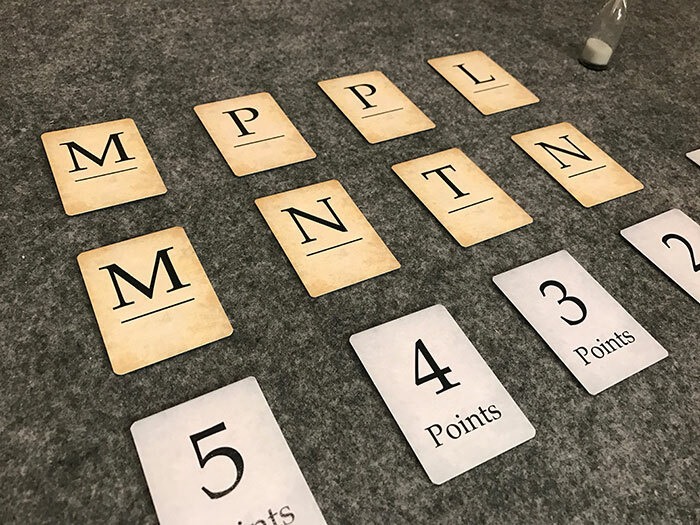 After all seven rounds, each player will choose their top five scoring words and add those points to all their bonus points gained throughout the game. Any negative points for penalties (for challenging a word and being wrong) will be subtracted and the final number will be the player’s score for the game. See what I mean? Wordsy is weird, but a good weird. 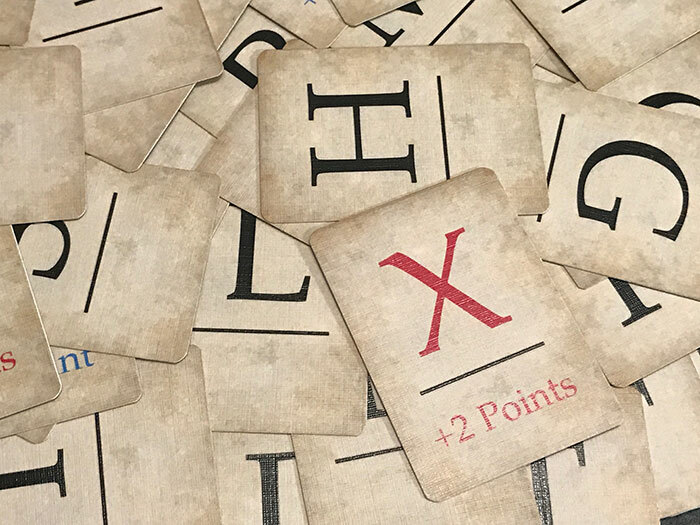 It’s a game that takes the standard mechanic of “pick x letters from the group to make a word” and flips it on its head with an interesting twist. Not only does it mix things up, but it makes you have to think in a different way in order to succeed. I’m not going to pretend like i’m significantly better at this than any other word game, but its freeform mechanic of thinking outside the box in order to create words really engages my brain in just the right way. Though it takes some time to figure out how to do that, it’s worth it. I’ve really enjoyed it. Still, no game is without its flaws. Specifically, one of the biggest things that stood out to me was the confusion in explaining how the scoring system works. Perhaps I just haven’t figured out how to explain it well, but I’ve struggled to help players comprehend how exactly the bonuses work. Anytime you have multiple “if this, then that” structures, it can be easy to confuse them. When adding in multiple variants of “equal to or greater than” situations, it can be tough. Still, I don’t think this is a huge deal as it irons itself out. Once the game gets going, players begin to understand why the scoring works the way it does. Other than the scoring confusion, I really didn’t find many flaws with the game. Overall, it is a fantastic word game that sets itself apart from the pack. It feels familiar, yet still new and fresh. 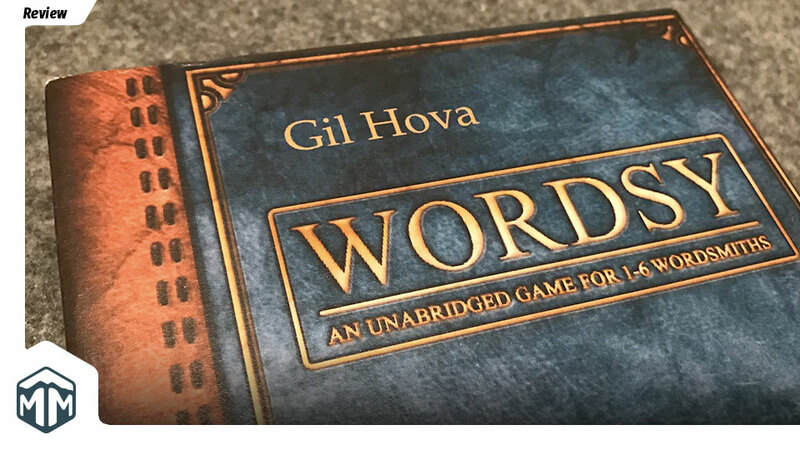 Since the game asks players to pick a reference book up front to verify questionable words, there is a lot of room for creativity in your choices. We played with a standard Webster’s dictionary, but one friend suggested throwing in the D&D monsters manual to mix things up. It’s just extremely flexible. If you like word games, you’re going to love Wordsy. If your love of word games persists through the pain of being bad at them, you’ll really enjoy it as well. If you just plain dislike word games, well… that’s alright. You can secretly love Wordsy with the rest of us closet word gamers. At least, you will when no one’s looking. Make sure to check out the Wordsy Kickstarter! Also, if this game intrigues you, Gil has created a Wordsy Bot that you can play with on Twitter. 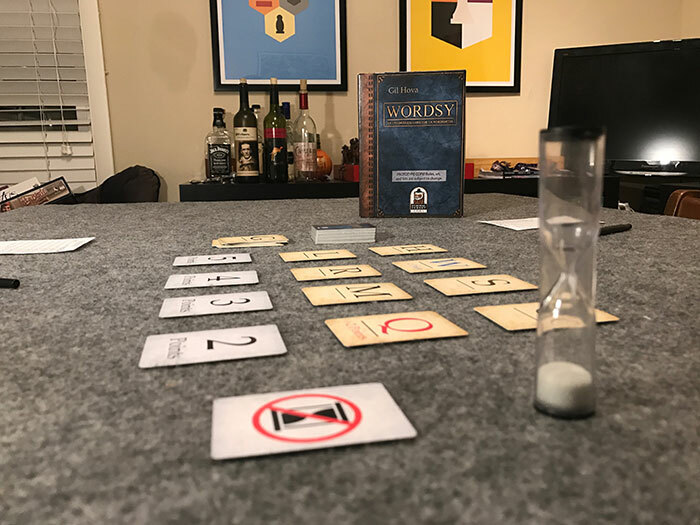 Check it out at @WordsyBot or check out the Wordsy page for instructions (and a link to a free print and play version!). What do you think of word games? Love them? Hate them? Indifferent? Let us know in the comments! First Take Fridays – Degenesis of the Forbidden Hero’s Dragon War?